How to tie deep-diving flies that hook fish, not the streambed! A GOOD FLY SATISFIES SEVERAL CRITERIA First, it looks and acts like something fish want to eat. Next, it is tied using materials that help put it at the proper place in the water column: on the surface, near the bottom, or somewhere in between. In addition, those materials should be readily available. Finally, the fly should not take too long to make. With those criteria as starting points, the next question is: What flies do I need for the kind of fishing I do? Most of us don’t do just one type of fishing. We enjoy trying to figure out what the fish want at a particular time of day and season, and under different weather conditions. 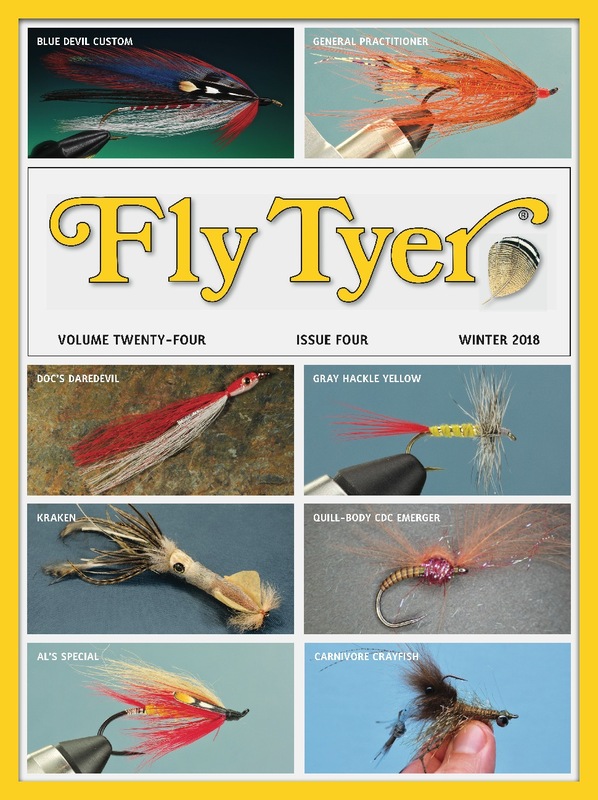 We tie a variety of flies and vary our fishing techniques to meet the changing conditions. I’ve developed three patterns that I think meet all the foregoing requirements. They look like prey that fish really like, they’re intentionally tied to fish deep, the materials are easy to find, and they don’t take very long to tie. Oh, and the smallmouth bass and trout love them. I call them my Hook-Up series. The Hook-Up Hellgrammite, Hook-Up Crayfish, and Hook-Up Stonefly actually go beyond the search for the proper fly to meet the prevailing conditions. Instead, they represent food that a hungry trout or smallmouth bass will generally not pass up if the opportunity presents itself; in other words, they work anytime. I call them the Hook-Up series because when these flies are fished, their hooks flip over and ride with the points on top. This configuration gives them at least a fighting chance to avoid snagging the bottom, which is important because that is where I fish them. It’s no secret that smallmouth bass have a fondness for hellgrammites. What is not so widely known is that trout really like them, too. Hellgrammites are dobsonfly larvae. They live in cracks, crevices, and under rocks on the streambed for up to three years before crawling out of the water to pupate. They don’t really swim, but if they are dislodged, they exhibit an undulating motion as they try to get back to the bottom. Consider this movement when developing a hellgrammite imitation. Other obvious characteristics are size and color. There are more than 20 species in the United States, and they all grow to be fairly large, some up to four inches long. As for color, hellgrammites are mostly black, brown, or dark olive, although some are lighter colored and others appear mottled. I incorporate those characteristics in the Hook-Up Hellgrammite. I’ve already discussed weighting the curved-shank hook to get the fly near the bottom with the point on top. Next, I needed to address the large size. To tie a big fly that would undulate in the water requiresan extended body. It didn’t take me long to decide on using ostrich herl for the extended body. Other tiers have used ostrich herl for this purpose, too. For example, Harry Murray uses ostrich herl for the extended body of his fl y called Murray’s Hellgrammite. Hook: Tiemco TMC200R, Dai-Riki 270, or a similar 3X-long, curved-shank hook, size 6 or 4. Legs: Black rabbit fu rabbit fur. Rib: Black Monocord thread or medium Ultra Wire.